I blog on this theme so often, that I've gone from outrage to resigned disgust. It's happened again. It's happened here in the Pacific Northwest again. And this time, I think even Venom can agree, it's a bit more significant that my bumper sticker. I am, of course, talking about Republicans being victimized by the very behavior they are accused of by the Left. Thanks for the Memory to Powerline via Ace of Spades HQ. According to the Seattle Times, The Washington state headquarters for the president's re-election campaign was broken into last night, and police are investigating the theft of three computers from the Bellevue office. Missing are laptop computers used by the campaign's executive director, the head of the get-out-the-vote effort and one that had been set for delivery to the campaign's Southwest Washington field director, said Jon Seaton, executive director of the state's George W. Bush campaign. State Republican Party Chairman Chris Vance called it a "Watergate-style break in" and said he suspects Democrats are behind it. "If you're just some burglar looking for computers to sell to buy drugs you take every laptop in the office maybe," he said. "But they knew exactly whose computers to get. They got the executive director's computer and the get-out-the-vote director's computer." Of course, the Democrats are denying any involvement. And while there's no reason to believe the incident was orchestrated by Democrats, it seems apparent that whoever did this was politically motivated and knew exactly what they were looking for. 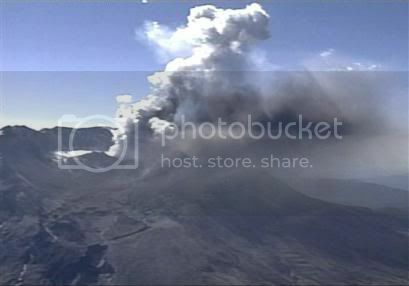 MOUNT ST. HELENS NATIONAL VOLCANIC MONUMENT (Reuters) - Mount St. Helens spewed steam and gray ash from a small explosive eruption in its crater on Friday, as the volcano in Washington state awoke from its slumber for the first time in nearly two decades. A plume rose in a column from the crater just after 12 p.m. PDT in the first eruption since 1986, but was well below the scale of the catastrophic 1980 eruption that blew off the top of the mountain and spread ash across North America. "This is exactly the kind of thing we've been forecasting to happen, which is a small steam and ash explosion that could send things up several tens of thousand feet above the rim of Mount St. Helens," said Cynthia Gardner, seismologist for the U.S. Geological Survey (news - web sites), "How long it will last we don't know." A team of geologists was installing equipment in the crater of the volcano, and the U.S. Geological Survey said they were trying to determine how safe they were. The plume of steam and ash was being carried to the northwest by the wind over uninhabited areas, said Peter Frenzen, a U.S. Forestry Service official. There were several hundred witnesses at the Johnston Ridge Observatory, but they did not report hearing any loud explosions. Earlier on Friday, government scientists reported that the lava dome created after the 1980 eruption had swollen slightly slightly and that cracks appeared on the glacier inside the rumbling volcano's crater. The 1980 eruption killed 57 people, destroyed more than 200 homes and devastated hundreds of square miles of surrounding land. Ash from that outpouring billowed across the continent and was carried as far east as Oklahoma. Recent activity, which started with a series of small earthquakes a week ago and a 2.5-inch shift in the lava dome's location, is happening within the horseshoe-shaped crater that formed after the eruption. Government scientists and officials said that the main concern was whether a plume of ash would form and interfere with air traffic. Mount St. Helens is in southeastern Washington, about 100 miles south of Seattle and 50 miles north of Oregon's largest city, Portland. Air traffic officials said they were on alert and prepared to divert air traffic in case of an ash-spewing eruption. Seismologists said there was no connection between activity at Mount St. Helens and a strong earthquake near Parkfield, California or a smaller series of quakes in Alaska earlier this week. The violent eruption of Mount St. Helens on May 18, 1980, blew off the top of the volcano, reducing its summit from 9,677 feet to 8,364 feet. In addition to the 1986 eruption of the mountain's lava dome, strong earthquakes were detected in 1989, when fresh magma entered the volcano's lava system. A northwesterly flow coupled with a weak section of the jet stream means we may get some ash here in Eugene, if it hangs in the air long enough. We'll see. I may live in the region, but Rusty at MyPetJawa has better blog coverage of the event. My mom emailed me with the news. She was recalling the 1980 eruption, when ash fell in our small town in Idaho, several hundred miles to the east, and the sky turned blood red. It was eerie. SYNOPSIS...A STRONG UPPER HIGH WAS OVER THE EASTERN PACIFIC OCEAN THIS MORNING...AND WILL SLOWLY MOVE ONSHORE AND OVER THE REGION THROUGH THE WEEKEND. THE LOW LEVEL WIND FLOW IS OFFSHORE THIS MORNING...BUT WILL WEAKEN THIS WEEKEND AS THE UPPER HIGH MOVES OVERHEAD. THE CURRENT NORTHERLY UPPER LEVEL WIND WILL WEAKEN THIS WEEKEND. A MARINE LAYER WILL DEVELOP ALONG THE COAST THROUGH SATURDAY AND SPREAD INLAND THROUGH THE COASTAL GAPS LATER THIS WEEKEND AND EARLY NEXT WEEK. THE UPPER RIDGE SHOWS SIGNS OF WEAKENING THE MIDDLE OF NEXT WEEK WITH A WEAK FRONT POSSIBLE TUESDAY WITH ADDITIONAL SYSTEMS LATER IN THE WEEK. ELEVATIONS BELOW ARE HEIGHTS ABOVE MEAN SEA LEVEL. MT. ST. HELENS CRATER FLOOR IS AT 6279 FT. WIND FORECASTS BELOW 6279 FT APPLY TO NEARBY LOWER ELEVATIONS. WIND DIRECTIONS ARE BASED ON TRUE NORTH AND ARE THE DIRECTION THE WIND IS BLOWING FROM. WIND SPEEDS ARE IN MILES PER HOUR. EXAMPLE...36005...REPRESENTS A WIND FROM 360 DEGREES AT 05 MPH. Weather Channel Animated Feed of Most Recent Satellite coverage of the PNW. So far the eruption barely shows as anything on the map -- a tiny speck of gray just a bit NE of Portland. Nothing compared to '80. We'll see if it pumps enough ash to even show up. Rusty links to a Live Feed from KGW-TV/DT Portland & KING-TV/DT Seattle. 6. Isaac's wife Rebekah is from Nahor, which is in Iraq. Indeed Iraq is a country with deep roots and is a very significant country in the Bible. No other nation, except Israel, has more history and prophecy associated it than Iraq. The email goes on to make some observations regarding the current conflict and certainpassages in the Koran, but since I'm not a Muslim, and cannot confirm the accuracy of the observation, I will leave it out. This is all just an introduction to my actual point, however. But since I intend to quote the Bible to emphasize the actual point, I thought it would be interesting. I watched the debate last night. I've posted on other threads on other blogs regarding how I think it went, so I won't here. What I do want to comment on is a comment by John Kerry, which was echoed today in another reader's comment to another blog. The comment was that while Kerry acknowledges the need to eliminate Saddam Hussein, he felt that Bush failed to exhaust all diplomatic options, and that he should have waited longer to use the military option. Habakkuk 1:2 O LORD, how long shall I cry for help, and thou wilt not hear? Or cry to thee "Violence!" and thou wilt not save? How long? How much longer should we have let the sanctions work? How many more UN Resolutions? Months? Years? 1 resolution? 10? 100? Given what we know about the Oil for Food corruption, do you think he really would have cracked? And if they didn't work then, then what? Would you honestly then suupport military action? If not, would we have lifted sanctions? And what response from Saddam would have been considered satisfactory? If he complied with inspections, and then the UN lifted sanctions, and he started all over again, then what? Anyone who knows me personally knows that I'm being laid off in a week. Well, I finally got a call back for an interview. It's for a company that manufactures a product that used to be manufactured by the company my call center now supports, so there's a bit of an inside track. Wish me luck! Well, phone tag didn't last long. I called the recruiter, left a message, and got a call back within ten minutes. I'm scheduled to interview on Monday. Here's the best part: If I get the job, I start training on the 11th, after being laid off on the 8th. I would qualify for my severance pay from the old job and go right to the new one without missing a day of work.